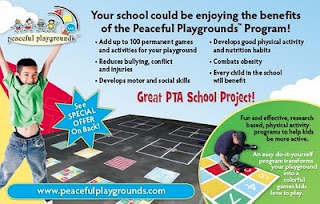 Your school could be enjoying the benefits of the Peaceful Playgrounds Program. Why wait? Put an end to those playground hassles and headaches. Start planning now for the fall and a successful opening to the school year. Summer is the perfect time to paint over 100 permanent games and activities on the playground. Peaceful Playgrounds is a "do-it-yourself" program which transforms your school into a variety of games and activities kids love to play. The Peaceful Playgrounds Comprehensive Kit comes with all the materials you need to insure safe and active play. Join the over 8000 schools nationwide and reduce school yard bullying, playground injuries and conflicts while getting children more active. Every child in the school benefits from this award winning childhood obesity intervention.